Microsoft has this week revealed they will be making their wall mounted Surface Hub, that was unveiled at the beginning of this year during CES 2015 available to pre-order next month with prices starting from $7,000. The Microsoft Surface Hub will be available to pre-order from July 1st and provides a way for teams to work together whilst brainstorming or during meetings. Microsoft has designed the Surface Hub to replace the traditional white board and provide users with a way of both presenting ideas as well as collating information. Microsoft has created two Surface Hub versions one measuring 55 inches offering a 1080p resolution that will be priced at $6,999, and a larger 84 inch model offering a 4K Ultra HD resolution priced at$19,999. Watch the promotional video below to learn more about the features and functions of the new Surface Hub that from next month will be available in a 24 markets around the world including the US, Canada, the UK, Australia, Japan, and Singapore and units will start shipping during September of this year. 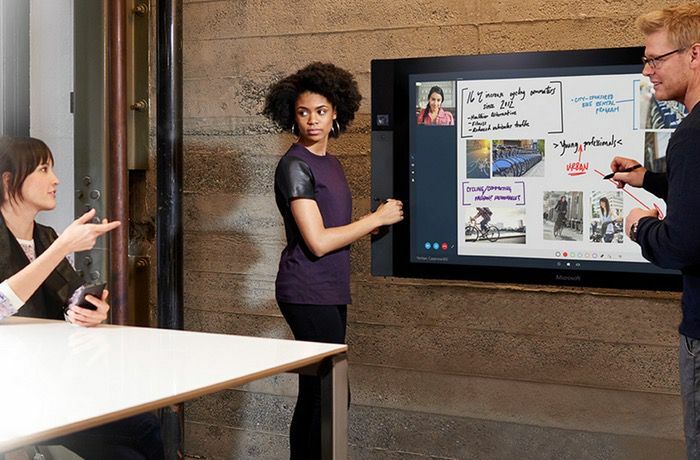 “Microsoft Surface Hub reimagines the meeting experience so that you can unlock the power of the group. You can walk up and join a Skype for Business meeting with a single tap, and share content effortlessly, so that you spend your time connecting to people rather than technology. And since you can easily send meeting notes and content, you can communicate outcomes and action points.